Johann Helfrich von Müller was born in Cleve (a town in the northwest of North Rhine-Westphalia in Germany), on 16 January, 1746, in the family of Lorenz Friedrich Müller (1715-1796), a colonel of the artillery, who worked as an architect and chief engineer in Giessen, and Maria Magdalena Josepha Hambloch (1726-1800). Johann had a brother, Franz, who later became a lieutenant colonel in the British Army. The German writer and journalist Helfrich Peter Sturz was their cousin. 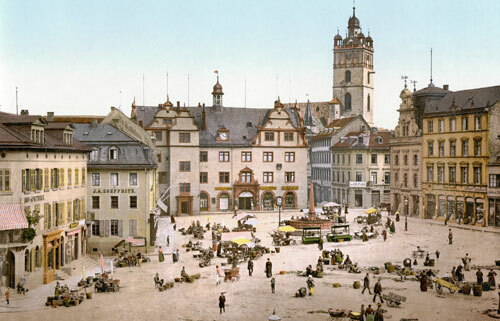 In 1753 the family moved to Darmstadt, where Johann received his initial education at small private schools, getting private lessons in languages and drawing. Later he was sent to study at the Darmstadt Grammar School. In the spring of 1762, he became a cadet in the Artillery Corps of the Hessian army at Giessen, where his family had moved, and began to attend lectures in mathematics and physics at the University of Giessen (Interestingly, at the same university some 20 years before lectured as a professor of mathematics one of the creators of early calculating machine—Christian Ludwig Gersten). Johann's father, Lorenz, who was in the building trade (architect and engineer), and was a son of the architect and civil engineer Helfrich Müller (1686–1759), wanted his son to carry on the family tradition, but Johann appears to have found certain other careers equally tempting. While still at the grammar school, he wanted to become a painter; at the university he hoped to be a professor of mathematics and physics. Soon however he discovered that the profession of an engineer was the most interesting of all and he devoted much time to reading books on statistics, hydraulics and mechanics. In 1769, the Artillery Corps was reduced in strength and Müller was forced to look for work elsewhere. Shortly afterwards, he was employed as an engineer by Prince Georg Wilhelm, the Governor in Giessen—a man with wide interests in both civil and military engineering and architecture. In 1769/1770 Müller made an extensive educational travel to Italy (Rome, Napoli and Venetia) and Austria (Wien). In April 1772, Prince Wilhelm took Müller with him on a five month trip to Paris, where they visited and studied many of the marvelous buildings and machines in the city and at St. Cloud, Versailles and Marly. On his return from the trip, Müller devoted most of his time to architectural and mechanical design and various financial calculations for his master. In February 1774, Müller became building inspector in Darmstadt and three years later master builder with the responsibility for designing and maintaining buildings (Ingenieur Hauptman). He also was expected to act as an adviser in case of emergencies such as floods. In 1778 he returned to the military service as a Captain in Artillery Corps, to be raised as a Lieutenant-Colonel in 1797, and a Colonel in 1800. In 1770s Müller took part in the design of several public buildings in Darmstadt. The fountain in the Market Square in the front of the old Rathaus (Town hall) of Darmstadt, built by design by Johann Müller in 1780, is still preserved (see the lower image). Johann Müller was a person of a very creative mind and started to make inventions from the beginning of 1770s. First he created, by an order from the Prince, a theatre, equipped with optical and mechanical effects for the children of the Prince. Later on he designed a large and powerful burning mirror, sun clock, air pump, air gun, barometer, range finder, and even a perpetuum mobile, but the most interesting for us invention was certainly his calculating device (see the calculating machine of Johann Müller) in 1780s. In the period 1776-1790 Müller was the state architect of Giessen. From 1792 until his retirement in 1820 Müller served as a Hofmeister and Major in Darmstadt. For his efforts and contribution he was knighted by the Grand Duke of Hesse on 23 June, 1810 (i.e. he became von Müller). On 19 August 1781, Müller married to Catherine Fabrice Johanetta von Westerfeld (1761-1830), a daughter of Esaias Fabrice von Westerfeld (1709–1779) and Elisabeth Katharine Schröder (1724–1765). The family had five children—two daughters and three sons, but unfortunately all died young, except for one of the daughters—Friederike (1784-1841). Johann Helfrich von Müller died on 12 June, 1830, in Darmstadt.